I'd love to subscribe to the Daily Gnus, but they don't deliver in my area. Tonight I attended my first Photojournalism class. It was scary. You have to buy expensive equipment and there are things called f-stops and it's all very complicated. I'm now reminded why I'm a cartoonist and not a photographer. It took me this long to master the pen, and the pen does not have a zoom lens. Anyhow, I have this class every Tuesday night, right before I update the comic, so look forward to hearing about it every Tuesday ad nauseam. Thanks for everyone who paid attention to Monday's beg for help. When my stats counter is actually working, it shows that site hits are already up since then. I'd repeat my whole rant again, but that's kind of a lot of work for me, and I don't want to strain myself. So, please bookmark Monday's rant and reread it over and over again until you constantly see it. Even when you aren't reading it. Even when your eyes are closed. It's the only way you'll learn. Seriously, I know I joke, but thanks for your help guys. This comic would be nowhere without you. 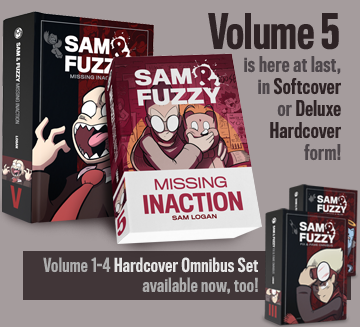 Its hard to believe, but Sam and Fuzzy has now been running for nine months straight. Over that time, I've managed to increase the frequency of strips, flesh out the site with the cast and gallery sections, and release bonus material like the Terrible Christmas Special. When I look at this site now, I finally feel like I have something substantial -- something complete -- to share with other people. Those of you who don't know me personally wouldn't know this, but I am absolutely terrible at maintaining large scale projects. You have no idea how many comics, novels, websites, and scale models of European cities made of cheese I have started, worked on for about a week, and then given up on. And yet, here I am. The site is still here. I'm still updating it. I'm still drawing three comics a week, and I'm still keeping ahead of schedule. And most importantly, I'm still having fun doing it. What am I getting at? (Circling around the point is another thing I am famous for in real life.) My point is this... Sam and Fuzzy is a serious project for me. I now realize that I'm probably going to be doing this for a long time. I want this comic to succeed. I want it to be HUGE. And I need all of your help. If you are reading this now, and you like this comic, I am asking for your help to promote it. If you have friends, please cram this comic down their throats. If you have a website, please plug me in the most gratuitous fashion possible. 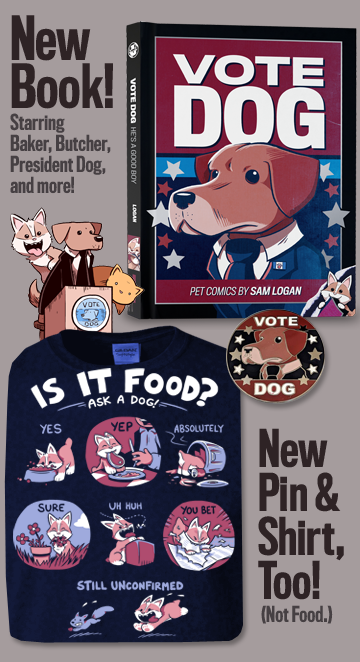 If you are a regular on any message boards, please go tell all the other regulars about Sam and Fuzzy. And hey, if you are new to the site, or if you just haven't spoken up yet, send me an email or pop on over to the forum. I'd love to hear from you!